Give me a boat and a line and I’m very happy. Thanks yours of the 1st. inst. with enclosure of the picture of 'Cindy' which I thought was terrific, she certainly looks wonderful - full of personality, this would be great to use in advertising some cereal product or something, its really attractive - it would be worth sending copies around to different firms (Baby Foods etc.) could be pretty profitable, its such a charming & natural pose. Note you have been having some hot weather, its been the same out here - some places last week were as high as 112, thank goodness I am close to the ocean where even at 90 it is'nt too bad as we get a cool breeze with it all of the time. Glad you enjoyed your trip back home, you were wise to close up shop & take a week's rest, thats good for you. Interesting to hear re the imrpovements taking place in Pittsburgh in the cleanup dept. It sure was a dirty place, last time I was there in '40, I think we played at the Harris Theatre with our review show, incidently, during that week, the roof of the [Alvin] Theatre caved in - fortunately the place was empty at the time & I don't think anyone was hurt, but it certainly put a scare into everybody & other Theatre business suffered through it, people were afraid to come in, I noticed during our performances that many people kept looking at the ceiling & were'nt paying much attention to what was going on with the show. Got a kick out of the cartoon clipping - that could have happened on the Walcott-Marciano fight - same situation exactly, remember? All we get out here on TV is three channels & those are re-broadcast from San Diego, the other Stations can't get through on account of Mountain area. However we do get the important shows & fights so its not too bad. I saw Patterson-Jackson bout, that was terrible, the worst championship fight I ever saw, never did think much of Jackson - very over rated, am looking forward to seeing Rademacher, they say he is very good, I understand this is his first 'Pro' fight. That Joe Louis tax situation is certainly strange, can't figure how the government let him get in so deep - I doubt if it will ever be paid off on account of the interest keeps mounting every year, Louis will end up owing Billions - the whole thing is ridiculous & impossible. No, have never been to Africa, we were negotiating to play there in '52 but were unable to arrange getting our money out - same thing with Australia & New Zealand, so of course no use us going. Do'nt think I would be up for the Safari dept. nebver was interested in hunting - fishing is more to my liking, give me a boat & a line & I'm very happy. The book you mention "Something Of Value" should be interesting, will try & get a copy next time I go iunto Santa Monica. Think thats all Earl, Mrs L. joins in regards & best to you all & trust alls well & happy, plus business starting to improve. On November 15, 1940, the roof of the Alvin Theatre in Pittsburgh, Pennsylvania collapsed injuring four people. Rocky Marciano beat title holder Jersey Joe Walcott with a single fierce knockout punch in 1952. Tommy Jackson fought two bouts with Floyd Patterson—in June 1956 and in July 1957. He lost both fights. On August 22, 1957, Pete Rademacher made boxing history by being the only man to fight for the world heavyweight championship in his first professional fight after he knocked out champion Floyd Patterson. Boxing legend Joe Louis never was able to earn enough money to satisfy the tax collectors. He died on April 12, 1981 in debt. Something of Value was a novel written by Robert Ruark and published in 1955 that is based on events that took place in Kenya Colony during the violent Mau Mau insurrection—an uprising that was confined almost exclusively to members of the Kikuyu tribe. It was turned into amovie in 1957, which was directed by Richard Brooks and starred Rock Hudson, Dana Wynter and Sidney Poitier. Regarding the rubber stamp, am enclosing a small pamphlet giving the address of where it was made. If you drop them a card, they will send you some literature of the different types of print they make, they have quite a variety to choose from plus a list of prices which are very reasonable - this one above cost $1.15. I have a smaller one which I use for my bank checques, cost 80¢. it takes about ten days after they receive your order. Note you have written the Blackhawk Film Co. for their catalogue, am pleased my suggestion appealed to you & the members, am sure you would create a lot of amusement in putting on your own shows, there are so many films you could run besides L&H which would be interesting & educational for you all. Well, all for now Gary. Regards & best to everybody. 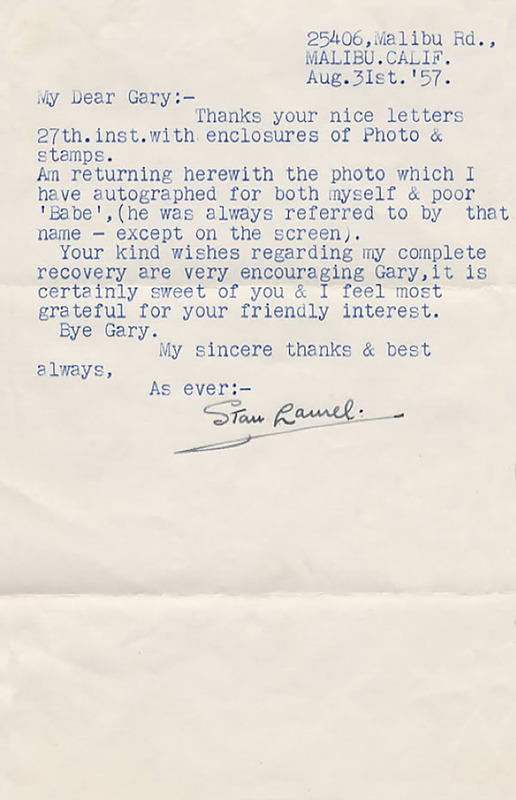 I missed answering a couple of your questions in my letter of yesterday, regarding Babe, the ST. JAMES Theatre in London, & I notice also the fishing in Hawaii. Yes, Babe is married, I talked with his wife last week in fact. Sorry to say his condition is just the same, just plain helpless it seems, I too wish something could be done for him. I have been in the Old St. James Theatre - never appeared there I really do'nt know why there should be such a fuss over tearing it down, they've got a million of those old landmarks over there, I could understand this issue if it were Drury Lane or something of great historical value, but there are so many of these old theatres that really should be eliminated to make way for modern buildings - half of them are eye sores & never used. No I did'nt get any sail fish in Honolulu, mostly small tuna, ea around 70 lbs in weight, you really get a fight on light tackle! Again thats all. Babe was a most kind, thoughtful, gentle and sensitive man. A gentleman in every sense of the word—a truly “gentle man.” He was not at all the blustering know-it-all, overpowering person he portrayed on the screen. In fact, just the opposite. He was easy to get along with and tried to always see the other side of a question. However, at rare times he was quick tempered but just as guick to get over it. He was always helpful and considerate of others and I never knew him to refuse anyone who was in trouble and needed help. Ben Shipman called me the day before and told me Babe had taken a turn for the worse and the end was expected any hours. Even knowing this, the final news came as a shock to me. Many thanks for your nice letter 8th.inst. I deeply appreciated your view point of my statement to your Dad, I guess you're right John in that sense, what I really meant, was the end of our active career, frankly I was so upset I was'nt paying any attention to what I said. Ben Shipman called me the day before & told me Babe had taken a turn for the worse & the end was expected any hours, even knowing this, the final news came as a shock to me. However, I think it was a blessing John - poor fellow must have been really suffering (they discovered recently he had a bad cancer condition), so under the circumstances there was no hope of his ever recovering. What a tragic end to such a wonderful career. Eda joins in love & best to Jean & self, trust alls well & happy. Looking forward to seeing you real soon. I miss him more than anyone will ever know and feel quite lost, but I will forever cherish the wonderful memories I have of him and the many happy times we shared together in the past. Many thanks for the nice card of sympathy, your kind expressions were deeply appreciated. Even tho' I had been notified the day before [that] my dear Pal 'Babe,' was'nt expected to last but a few hours, the final news came as a shock & upset me very much - being such close friends for over 30 odd years, it was really a great blow. However, in situations like this we must be sensible & face facts, he has been suffering very much these last few weeks & in terrible pain (Cancer condition), so I feel it was a blessing that he was taken out of his misery, am sure he would have wished it so - I am happy in a sense that he has gone to rest - sad as it is. I miss him more than anyone will ever know & feel quite lost, but I will forever cherish the wonderful memories I have of him & the many happy times we shared together In the past - God Bless Him, he certainly did'nt deserve such a tragic end. My Dr. would'nt permit me to go to the services, so Mrs L & my daughter attended instead, it was a Masonic affair & beautifully conducted with many many friends & mourners, & banks of flowers filled the chapel, after which he was cremated. Will close now, do'nt feel much in the mood for correspondence, am sure you will understand. Mrs L joins in every good wish to you both & thanks again. I naturally feel terribly upset over Babe's death, but you're so right, your viewpoint is the sensible way to look at it, it IS a blessing that he was taken out of his suffering & misery & we should feel very happy for him, I too am sure that would have been his wish. However, I miss him very much & feel quite lost - after our 30 odd years of close friendship & association. We were delighted to know you are planning a trip down here but wish you would make it the following Saturday (the 24th) instead of this week (17th.) We have already made a date to visit & have dinner with a friend of ours in No. Hollywood, & we can't cancel it on account of her leaving for New York on Sunday - am sure you will fully understand the situation, & hope it will not upset your plans. If I do'nt hear from you I shall expect to see you on the 24th, Bikini's fat & all!. We certainly got a big kick re your examination business at the police dept. I really laughed out loud at your description of the typewriter routine, wish I could have been there, must have been a scream!. Think you are wise to cut out the diet bus. am sure that has a lot to do with all these illnesses going around. I too believe that was the start of Babe's trouble, I think if you want to take off weight, it should be done with exercise, not starving yourself. It was sweet of Wayne wanting to go to the funeral, but I think it would have been foolish to loose a days work over it, plus that long drive back & forth. I did'nt go, my Dr. did'nt think it wise, so Eda went with my daughter Lois instead. On account of being a cremation the services were held at the Mortuary (Pierce Bros. in Bev. Hllls.) & was a Masonic affair - no cemetary bus. at all. I understand there was a big turnout & the place was loaded with flowers. All for Now Betty - looking forward to seeing you on the 24th. Eda joins in love & best to Wayne & self. Many thanks for your expression of sympathy, it was indeed gracious of you Gary, & I deeply appreciate your kind thought - again my sincere thanks. I imagine you are glad the moving business is over with. Hope by now you are comfortably settled down again & enjoying your new home. I guess you heard the sad news of Mr Hardy's death. It was a great blow to me & it upset me very much, but in these situations we must consider it a blessing, he had been suffering painfully these last few weeks, so we should feel grateful that he was taken out of his misery. Am sure that is what he would have wished under the circumstances, God bless him. Glad you saw "Fra Diavalo" & liked it, I too thought it was one of our best films. The last time I saw it was in Italy in 1950, it was strange to hear ourselves speaking Italian language, I really got a kick out of it. It was interesting to note that you had a boy-friend - is this serious? Don't bother sending me pictures of Liverpool Rita, I am not too interested in seeing them, having been there many times, but I will send you some cards of Malibu as you are probably wondering what it looks like, & be interesting to you. All for now dear. My regards & best to your family & my love to your Grandad when you see him. My little Lois is married now and has two children, a boy and a girl (5 and 6). I see them all quite often. They live in Tarzana, out in the San Fernando Valley. Was certainly a pleasant surprise to hear from you after all these years - thought of you many times, & wondered where you were & what you were doing - sincerely hope alls well Jack & everythings O.K. Terribly sorry to learn the sad news of your Wife, am sure you miss her very much. I remember her very well on your honeymoon trip to the Coast. Those were happy memories - that was a long time ago - what year was that Jack? Am trying to recall who else was on the bill, I guess many of them have since passed on. My little Lois is married now & has two children, a boy & a girl (5 & 6) I see them all quite often, they live in Tarzana, out in the San Fernando Valley. Note you read about my dear pal and partner - needless to tell you it upset me very much - I feel lost without him after 30 odd years of close friendship & happy association. However, I feel the end came as a blessing, the poor fellow was really suffering the last few months & no hope of recovery. (Cancer) so am happy he was taken out of his pain. God bless him. I had a slight stroke a couple of years ago, but fortunately I made a good recovery & am able to get around again, but of course it has forced me into retirement, as I will never be in shape to do any strenuous work again. Anyway, I have no regrets & am happy & content living in a nice apt. right on the beach here in Malibu. Well Jack, I sure enjoyed hearing from you - drop me a line again whenever you feel like it. The commemorative grave marker installed at the head of Babe's grave by the Sons of the Desert in 1977 at Valhalla Memorial Park in Los Angeles, California. Sorry delay in reply to your 31st.inst. Due to the death of my dear friend and partner Mr Hardy, my correspondence got quite neglected. With pleasure I enclose you my autograph which you requested, also am sending you a small picture of the team, which I thought you may like to have as a souvenir of many happy memories. The death of my dear friend & Partner was a great shock to me even tho' I had been notified the day before that the end was near. I miss him terribly & feel quite lost - can't realise that he has gone. However, he suffered a great deal these last few weeks due to a cancer condition, so under the circumstances I feel it was a blessing he was taken out of his misery & pain, there was no possible hope for his recovery. A sad end to a wonderful career God bless him. Chaplin...is still and always will be the geatest in the comedy field. Thank you for your letters of 12th.& 19th.inst. Also for the book "Something Of Value" - press clippings etc. it was certainly kind of you to send the book, I shall look forward to reading it, as soon as I get through acknowledging a few stacks of condolence mail - several hundred so far, & still coming in from Foreign parts, am enclosing you a couple of stamps from the Gold Coast, Ghana, thought they would be interesting to you. I thought the Donald Kirkley article was very nice, but I certainly disagree in comparing us with Chaplin, to me he is still & always will be the GREATEST in the comedy field. "Camera Three" program was shown at 8-30 AM & secondly, I figured it could'nt have been too good & of no importance to be broadcast at such an early hour. Am sorry now I missed it. The Kipling verse was very interesting, I have read quite a few of his works but not this one. Am afraid I couldn't describe very much or very well the sights of London, I have seen all of the places you mention, but only two of the buildings I've been in. Dear Babe & I attended a large affair '47. in the Dorchester Hotel, we were invited by a Lord & Lady Rothmire (I think that was the name) they were in charge of the guest list dept. It was a social function, I think everybody was there except the Royal family. It was certainly a lavish sight - furs & diamonds etc. - waiters in knee britches, powdered wigs & all the fancy trappings. Being very formal, we of course had to wear white tie & tails (we never looked funnier!) anyway, we arrived quite late, due to our playing at the Palladium. The party was in full sway, as we were being ushered in, an old Lady was leaving with an entourage, with a lot of formality, we were introduced to her as Princess Mary Louise (I think the Grand-Daughter of Queen Victoria) she looked like she had a snout-full & was being escorted home - after the bowing & scraping was over she put on her lorgnette & thoroughly looked us over (slightly swaying) her eyes lit up, she said, 'Oh yes. I know you now - "I've seen you on the radio.!!" she then hiccoughed & was led out. Well, champagne was flowing till the wee early hours, but we were too busy autographing menu cards for the Dukes & Earls to get in on the fun - however, it remains a happy memory. I think I told you previously that I visited Drury Lane, that was in '32. saw Noel Coward's stage production of "Cavalcade", that too is a wonderful memory - sitting in the actual Royal Box, with the powdered wig dept. in attendance. Another place we were invited to look around was Scotland Yard, it was really interesting, especially the special privilege given us to look around their museum, whioch contains all kinds of paraphernalia used by well known criminals - all kinds of devices used in counterfeiting, murder weapons etc. that were actually used, the place is packed with all kinds of gadgets in glass cases, a card on each article, explaining the crime in which it was used. We were also taken on a trip on a police patrol boat around the Thames, that too was a very interesting trip. I was never inside the Tower Of London, but have crossed London Bridge many many times, the Marble Arch, Hyde Park, Piccadilly Circus & Oxford Circus, Leicester Square, Trafalgar Square, Buckingham Palace, the Strand etc. so many of these places it would be very difficult to picture them to you. The only thing to do is to visit there & see it all for yourself. I like to fish anywhere Earl, except fly fishing in streams. Yes, we hear the ocean breakers pounding on the beach quite loud, we are only a few feet away, at high tide the water is practically touching the building. The noise doesn't bother me at all, I sleep like a log. Am really enjoying it here, Mrs. L. too, we are both feeling much better living here, wish we'd done this long ago. It was interesting to note that you were a Mason - a wonderful organization. My Dad was a 32nd degree member in the Scottish Order, for some reason I never became one. I just had delivered to me a tape recorder, its a new type, only weighs 18 lbs. (about the size of a portable typewriter) really compact & easy to carry around, it has two speeds & is simple to operate, its called the 'Wollensack'. Do you have one, Earl? They are really nice to have, so many things you can do with them - recording TV & Radio shows etc. plus a lot of fun when you have company, for candid conversations, when they don't know that the machine is recording everything they say, some of these are very funny. Think thats about all for now. We have been having some hot weather this last week or so - around 90 today, even being so close to the ocean, it must be about 100 in Town & out in the Valley. Mrs Laurel joins in all the best to Mrs Shank, self & 'Cindy', trust you are all in good health & business starting to improve. Again my sincere thanks Earl for your kind thoughts & generous gestures, its a pleasure to know such nice people as you. Thanks your very nice letter 12th.inst. I appreciated very much your kind thoughts and sentiments - certainly gracious of you. The death of my dear friend & Partner was indeed a sad blow to me, it really shook me. I miss him terribly after 30 Odd years of a wonderful close friendship and happy association - God bless him. It was interesting to note that you were the head 'Gaffer' on the Fox lot and that we had met in the early thirties, our introduction must have been at the Roach studio as we did'nt work at 20th. till the early forties. Regarding the picture you have of L&H, if you care to send it on the me, I shall be happy to autograph it for you, in the meantime, I am enclosing you a small one with both autographs printed on which I use for fan mail, I had the signatures put on this way on account of poor Babe being paralyzed and unable to write - come to think of it, I do have a straight picture of us bearing actual autographs, so will enclose [one] of those too. Thanks Gary for your kind invitation to visit you sometime, it would be a pleasure, but am afraid my traveling days are over. I too had a Stroke a couple of years ago, fortunately it was slight and I made a pretty good recovery, even so, I am hindered in getting around as much as I'd like to. Am very pleased to know you are doing well & have such a wonderful family, wish you continued success and happiness. I have before me your last letter which you also included two post cards of you Oliver Hardy. As I’ve said before Stan, this means so much to me to have anything that you two great “Guys” had around you. Even though my son and daughter are 19 and 15 they too along with my wife rate you two as the very “tops” when it comes to naming our favorites of all time. By having your movies re-run it gives the to-days children such as our own a chance to really see how it was done so well in the days gone by. I can assure you that they love you just as we did in the food old days. The invitation to you for the famous Missouri ham and red-eye gravy still stands, so in the event you ever get back this way, all you have to do is to sit down and eat. It would certainly be great to have you if this is every possible. Was sorry to learn that you seldom go places due to your illness. You can be sure that we’ll have you in our prayers to get well so that we can enjoy your good company for many a year. Having been a small part of the good old days in Hollywood you can be sure that I do enjoy the great memories of visiting at your studios to watch you two gentlemen, and just to be around you are memories that will always remain. The nice 11x14 of you and babe are in my studio window. I put it there for people to see the “very best”. Many look it over daily and the remarks are all very nice. Would appreciate hearing from you again when you find time. Take good care of yourself Stan. Bye Stan, and God bless you. Many thanks your nice letter 8th.inst. Deeply appreciated your kind thoughts & sentiments over the death of poor Babe. His passing was a sad blow & a great loss to me, I shall miss him very very much, God Bless Him. Lucille went to San Francisco with her Mother to take a rest & to get away from the sad surroundings at home - as soon as she returns i will give her your message of sympathy. Poor Lucille has been through a terrible strain during Babe's long illness, she worked day & night to give him comfort & care, she was wonderful through it all. I have'nt heard anything of Jimmy Murphy either for the last year or so, I guess he is still Babysitting for Joan Crawford. Give Jack Alderson my best when you see him again. You will note change of address. I rented the house in Santa Monica & am now living in a nice apt. right on the beach here at Malibu & enjoying the change very much. Mrs L. joins in kindest regards to you both. Thanks your sweet letter 18th. inst. Yes, it was very sad about my dear Partner Mr Hardy passing on, even tho' I feel very upset over it, It was a blessing that was taken away from his suffering, I shall miss him terribly, but its for the best. God bless him. My Sister told me about all the strikes going on over there — the whole World is unsettled, trouble everywhere, its shocking, everybody so restless & unhappy & fighting among each other. Things have sure changed from the happy times we knew. I had a short note of sympathy from Georgie Wood, said he was feeling better but working very hard. I am sure he must be quite busy & doesn't get much time for personal correspondence — am sure if he had time, he would drop you a line. I know he feels very kindly towards you — why do'nt you drop him a line once in a while, am sure he would pleased to hear from you. I imagine the reason Jack Graham didn't call to see you was on account of Benny Barron being ill & didn't want to leave him, poor Benny is certainly having a rough time of it, he has been ailing for so long now. I had a letter too from Jackie Harrison, he seems to be going along OK, but not doing anything in the way of work — am afraid its too late now for him to get any kind of a job, its a shame that he ever gave up show business, he was so talented & could have made a great name for himself. Well dear, haven't much to tell you, we are enjoying the apt. by the sea, the fresh air is doing us both a lot of good. Eda joins in love & kind thoughts — take care of yourself Trixie & keep well. I deeply appreciated your kind letter & nice expression of your sentiments over the death of my dear friend & partner Mr Hardy. It was indeed a sad blow to me after all the many years of wonderful friendship & happy association - I shall miss him terribly. However, under the circumstances the end came as a blessing, he was suffering very much & in great pain due to a development of cancer, so there was no hope for recovery, just a long lingering & unhappy existence, it was a merciful end to it all God bless him. A sad end to a great career. I shall always treasure the many happy memories he has left behind. My sincere thanks to you both for your kind sympathy. Thank you for your letter 13th,inst. I appreciated very much your kind expression of sympathy over the death of my dear Friend and Partner Oliver Hardy. It was indeed a great loss to me & to all that knew him. God bless him. It was indeed a great loss - I shall miss him terribly after the many years of happy association. I remember very well you photographing us at the Palace Hotel during our visit to Southend - a happy memory. Thanks your nice letters 27th.inst. with enclosures of Photo & stamps. Am returning herewith the photo which I have autographed for both myself & poor 'Babe', (he was always referred to by that name - except on the screen). Your kind wishes regarding my complete recovery are very encouraging Gary, it is certainly sweet of you & I feel most grateful for your friendly interest. 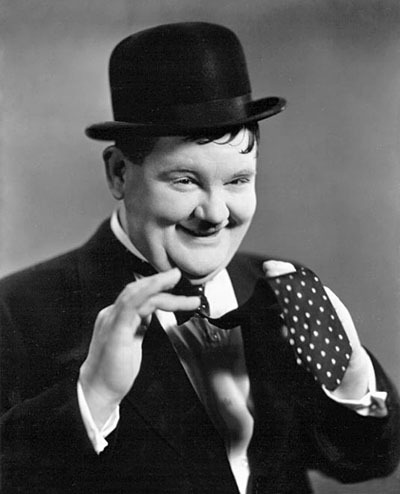 Oliver Hardy, rotund film comedian, died yesterday. Death came to the portly half of the famed Laurel and Hardy comedy team from the effects of a paralytic stroke he suffered last Sept. 12. So severe was the stroke that it left him almost completely paralyzed. He was unable to speak and could hardly move one arm. He had wasted away to a comparative shadow from his comical bumbling bulk which at the height of his fame bulged to 350 pounds. At his bedside when Hardy died was his wife, Mrs. Virginia Lucille Hardy, whom he wed 17 years ago when she was a studio script girl. Death occurred at the home of Hardy’s mother-In-law, Mrs. Monnie L. Jones, 5421 Auckland St., North Hollywood, where the comedian and his wife had been living for the last six months. And, in an apartment in Malibu, Hardy’s thin, lantern-jawed partner, Stan Laurel, also was ailing yesterday. 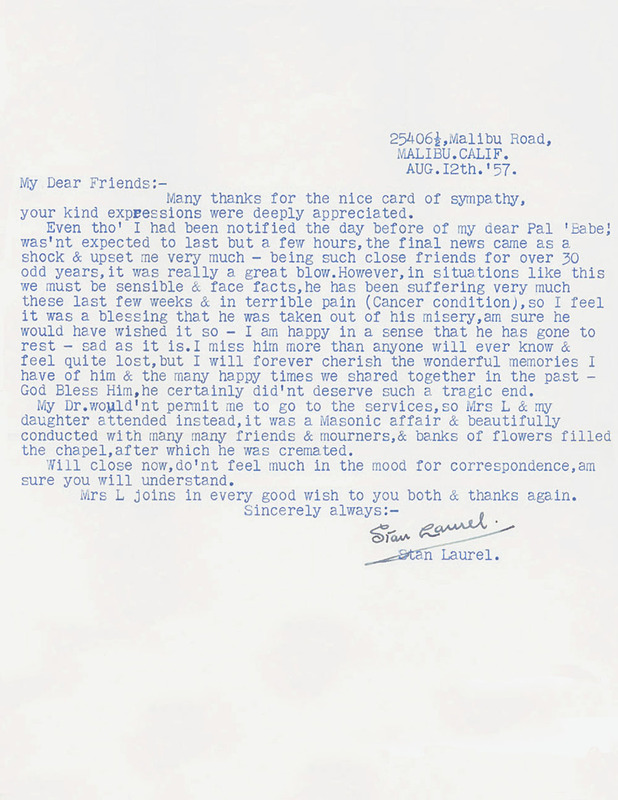 Laurel is now 67 and his wife said at first she preferred not to ask him to make any statement about the death of his old partner. Laurel suffered a stroke himself In 1955, but is reported to have almost completely recovered from its effects. Although they had not made a picture in Hollywood since 1945 when they appeared together in The Bullfighters, a comedy that was pieced together with scenes from Blood and Sand, popularity of the slapstick team has been soaring again on television. Their old comedies have received a warm welcome on TV as a new generation chuckles at the antics and situations that tickled theater audiences a quarter of a century ago. But the arrival of their old films on TV has not netted the slapstick team a nickel it was reported, because, of course, their contracts contained no provisions for television royalties. Over a 20-year period Laurel and Hardy fumbled their way through some 200 films. They began with two-reelers at the Hal Roach Studios and eventually graduated into full-length features. These included Pardon Us, Pack Up Your Troubles, Sons of the Desert, Babes In Toyland, Bonnie Scotland, The Bohemian Girl, Our Relations, Way Out West, Great Guns and many others. And always the format was the same: Hardy was the elephant on tippy-toe, who always got stuck in upper berths, daintily fingered his necktie, twitched his ridiculously tiny mustache, lost his too-small derby and rushed with clumsy gallantry to the distress of fair damsels—only to trip over a broom the simple-minded, open-faced Laurel had left in the way. Some of the fair damsels, then just youngsters, whom Laurel and Hardy helped launch to film fame were Lupe Velez, Jean Harlow, Paulette Goddard and Vivian Blaine. Born in Atlanta, Ga., Hardy spent high school and college vacations trouping through neighboring Southern States with vaudeville acts and minstrel shows. His father insisted that he study law and Hardy graduated from the University of Georgia Law School—and went into show business. He was in stock for four years and toured the South with his own singing act. He happened to be in Jacksonville, Fla., in 1913 when a movie company was there. They needed a fat comedian. And that was that. The die was not permanently cast, however, until Hardy teamed with Laurel in 1927. He had come to Hollywood in 1918, codirecting pictures with Larry Semon and directing a few himself. It was Hal Roach who finally recognized the comedy possibilities of Laurel and Hardy. Laurel, born of an English vaudeville family, had been kicking around the lot as an actor for a few years when the combine was formed. In their pictures Laurel called him Ollie, but away from the cameras and to everyone the blimplike Hardy was always Babe. Down through the years Laurel and Hardy had always been close friends, being almost psychic in their understanding of each other. Besides their tremendous following in this country, they command an even wider and deeply loyal world-wide army of fans. Much of their comedy was in pantomime, which always delighted foreign audiences. In addition to his widow, Hardy leaves only a sister, Mrs. Elizabeth Hardy Sage of Atlanta. Masonic funeral service will be conducted tomorroW at 1 p.m., in Pierce Bros. Beverly Hills Mortuary, followed by cremation and inurnment in Garden of Hope, Valhalla Memorial Park, North Hollywood. Television, like any Greek god worth his dignity, has done much good and much not so good. One of the best things, to our thinking, has been its revival of the old Laurel and Hardy comedies. Mainly they have been scheduled for the children’s hours; but we often sat back in the corner ourselves, delighted to watch once again those two beautiful clowns. There was a genuine craftsmen’s lack of pretension about Laurel and Hardy movies. They weren’t masterpieces; you rarely recall their names; and never the situations; juvenile leads or pretty actresses intermixed with the comic episodes. You recall, only skinny Laurel playing against fat Hardy as a bow plays against a fiddle, and you think of the gay, ingenious music. Laurel and Hardy won’t make any more such music. Oliver Hardy died the other day. But we expect that sequences from their films will become as classic as the fun of Chaplin, the Marx Brothers; W.C. Fields and Buster Keaton. Hollywood—especially the Hollywood of 1930—40 vintage—Is expected to gather solemnly at 1 p.m. today to pay final tribute to Oliver Hardy, the fat funnyman of the slapstick era. But Hardy’s old partner and beloved friend, Stan Laurel, won’t be there. Ailing himself, Laurel, now 67, has been forbidden by his physician to leave his Malibu apartment to attend the rites. The Masonic services for Hardy will be conducted at Pierce Bros. Beverly Hills Mortuary. They will be followed by cremation and private inurnment in the Garden of Rope at Valhalla Memorial Park, North Hollywood. Hardy, 65, died Wednesday morning after a series of paralytic strokes. The first, which he suffered last Sept. 12, left him almost completely paralyzed. It reduced his 350 pound bulk to an emaciated shadow of 120 pounds. He suffered a second stroke last Sunday. And a third, which struck Tuesday, left him in a coma from which he did not emerge. Over a 20-year period that began in 1927, the team of Laurel and Hardy made some 200 movies. Revived on television in recent years, their two-reelers and full-length features have created a new generation of fans. But the new popularity brought not a nickel of financial gain. Their old movie contracts contained no provisions for TV royalties. In addition to his widow, Mrs. Virginia Lucille Hardy, who was at his bedside when he died, Hardy leaves only a sister, Mrs. Elizabeth Hardy Sage of Atlanta, Ga., the comedian’s birthplace. The movie colony Friday paid last respects to Oliver Hardy, 65, rotund partner in the Laurel and Hardy slapstick team, while ailing Stan Laurel mourned at home. 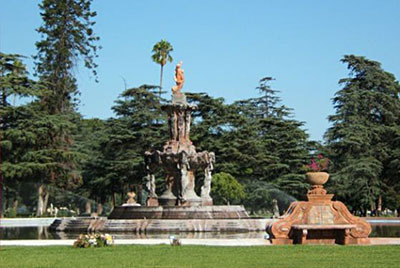 Masonic funeral rites for Hardy were followed by cremation and interment at Valhalla Memorial Park in North Hollywood. Members of the family, a few close friends and a scattering of filmland oldtirners wept openly at the bier during services which Laurel, 67, was unable to attend. Hardy died Wednesday from results or a paralytic stroke he suffered nine months ago. Laurel, with whom ho made more than 200 films during their 30-year reign as kings of comedy, is recovering at his Malibu beach home from a less severe stroke in 1955 but was instructed by his doctor not to attend the funeral. The slapstick comedy team of Oliver Hardy and Stan Laurel has been broken at last with the death of the bigger and more irascible of the two, Hardy, who died in North Hollywood this week at the age of 65. The friendship of this ill-asserted pair endured after they broke up their stage partnership and retired. At his peak Hardy weighed 300 pounds. but a couple of years ago on his doctor’s order he went on a diet and was down to 200 when he died. As for weight and its effect on health, Stan Laurel, 67, was as skinny as they come, but he suffered a paralytic stroke two vents ago, though he is still alive, This saturnine little man was the perfect foil for his huge partner. Hardy was more than just a large party who found nothing undignified about making a fool of himself to please the public—and this team for many years were tops in their field. He was born in Atlanta. Ga., but he did not let a degree from the University of Georgie Law School cramp his slapstick style. He was not exactly rolling in wealth in his declining years, friends reported, but be was comfortably well off—able, apparently, to afford a $25000 doctor’s bill for the last two years of his life. A stroke suffered last fall was the final blow. 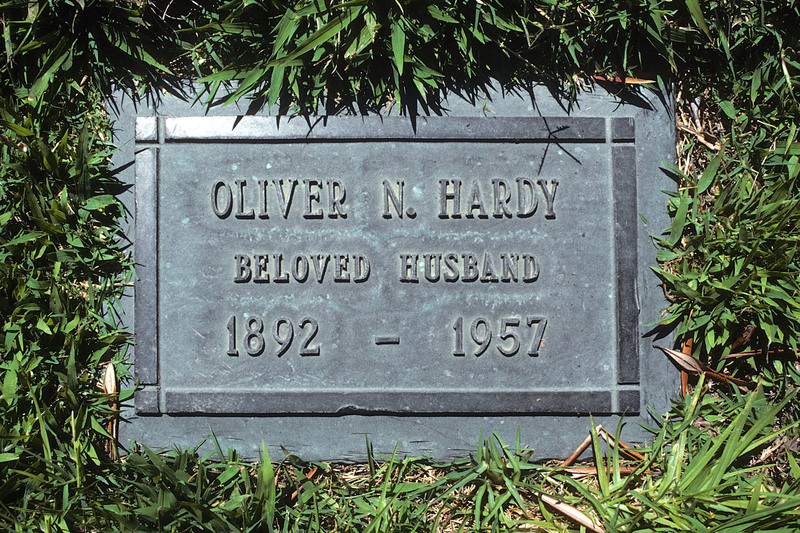 The passing of Oliver Hardy was a sorrowful event for our household. The team of Laurel and Hardy produced some of the best in comedy. When I was a small boy I used to look forward to their films in my local movie house as my family does now on TV. We have seen them again and again and have never tired of those two great clowns. The team has broken up but comedians today should study hard and long to learn from these experts. May I personally echo what must be in many people’s minds today, a heartfelt good-by to you, Mr. Hardy, and a golden Oscar to the team of Laurel and Hardy. Stan Laurel is a single act now, but the sad-faced little man with the big ears says he will never perform again. The death of his jovial, rotund partner this week spelled the end of both their careers. 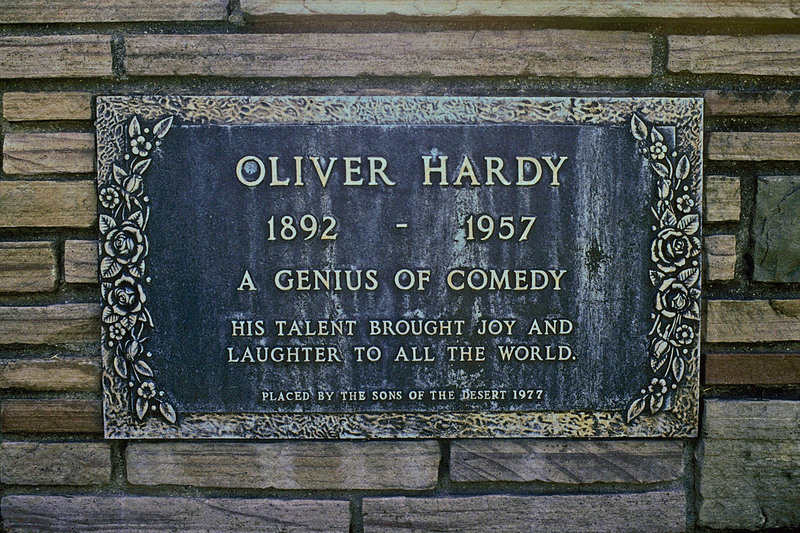 Oliver Hardy’s passing left Laurel with happy memories of the 30 years they worked together harvesting laughs in some 300 movies, silent and talkie. It also brought to mind the bitterness of recent years when their old pictures made a fortune on TV but neither of them received a penny. “The TV people have mutilated our films so badly I get angry watching them,” the comedian said. Sitting behind a desk in his small study, Laurel looked his 64 years. He moves slowly and only rarely breaks into his famed grin. His left arm and leg are immobilized, the result of a stroke. 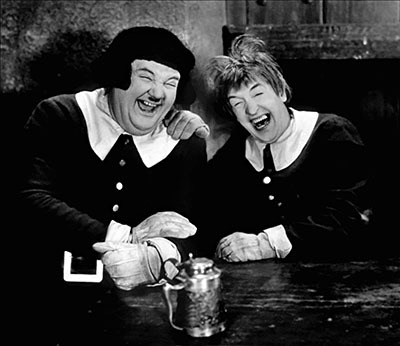 Laurel, whom most old-timers credit with being the “brains” of the comedy team, recalled some of the pictures he and “Babe” Hardy made together. Other big hits scored by the team were Way Out West, Sons of the Desert and Babes in Toyland. Laurel mapped out most of the routines while Hardy played golf. Once on the set, though Hardy would ad lib his own ideas. “Babe was always a very funny man to me,” Laurel went on, the faint trace of a smile playing on his thin face. Last appearance of the great team was on a television show almost three years ago. But prior to the strokes suffered by both men, a video comedy series was being prepared for them. “It wasn’t meant to be,” Laurel says philosophically. “It is strange, though that our pictures still are popular all over the world. Other, greater comedians have not lasted, and I don’t know the reason for it. I’m sure it is not because of any great talent on our part.